The ninth chapter and my second Engrish release. I don’t think that my moon language knowledge is good, so expect (many) mistranslation. Oh yeah, if anybody know a proper waterwheel component designation please tell me. Google and Wiki doesn’t really helpful. Don’t know about Noria? Click here. It was at the noon on the 6th day after the manufacturing of aqueduct parts began. Kazura was at his mansion in Japan to receive the waterwheel that was delivered by the director and his employees. The waterwheel parts that loaded on the truck in front of him are mostly made from wood, while some clasp are made from metal. Although the big parts size can barely fit on the pullcart, it seems that there would be no problem in transporting it. Although the director become confused when heard about the foyer, when he received the cheque his expression become bright while saying, 「Thank you very much」. He called the employees to start unloading the parts at the pullcart inside the house. While pulling the pullcart that half-filled with waterwheel parts, Kazura crossed the border to other world. He comes out from the usual tree copse and the familiar village scenery could be seen. Not far from the village are the fields. More than 10 villagers are working on it using the farming tools that Kazura had provided. After this, I need to buy another pullcart. While thinking about this, Kazura began to pull the pushcart toward village chief’s house. The villagers who tended the fields cease their work when they saw Kazura. While talking about these things, the villagers and Kazura pulled the pull cart together toward Valetta’s house. While pulling the pull cart, the villagers were chatting with each other. Kazura didn’t understand why nobody asked about where the country that Kazura will go back to is. When Kazura and the others arrived at the house’s front yard, Valetta immediately came out from the house. To immediately come out when they arrived, it seems that she was on standby for this moment. Lowering the pull cart to the front, the villagers cooperated in unloading the parts. Although the parts quantity is quite a lot, as expected, with the help of more than 10 people they finished unloading the parts in several minutes. For several days before, the village chief had been asked by Kazura to direct the villagers in digging aqueduct from the river to the village. The majority of villagers are participated in building it, so the aqueduct will turned out splendidly. 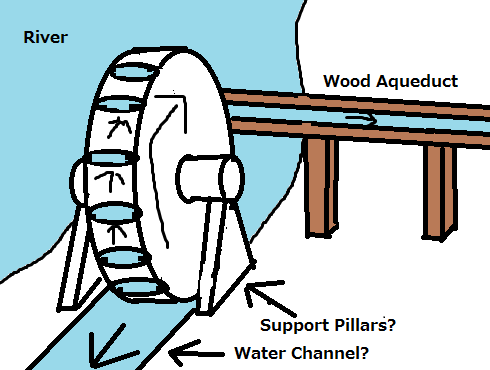 If the aqueduct isn’t finished then there is no meaning to install the waterwheel-powered pump. Because the aqueduct had been scheduled to be completed around this time, even if it still isn’t finished, then with a little time and help, they can completed it on time. Kazura said that to everyone and once again he pulls the pullcart toward the passage in the inside of the tree copse. Near the village's exit, they found the village chief and others digging the aqueduct. It appears that their work progress is just as planned. Incidentally, Valleta was waiting near the opening of tree copse where Kazura going, so she helped with pulling the pullcart. 「Yes, the only job left is to dig the aqueduct from this place to the reservoir. The village chief stops digging the aqueduct while smiling to Kazura, who was pulling the pullcart. The other villagers are also stop to greet Kazura before continuing their work. While listening to the brief report about the work progress from Village chief, it was about the second aqueduct in Kazura plan. Afterward it can be reinforced with stone if necessary. The water aqueduct will connect the upstream to the reservoir in the village, but before the aqueduct enters the village it is diverted into two branches. 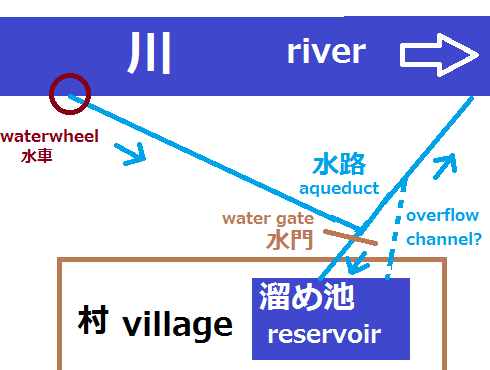 The first aqueduct branch goes toward reservoir in the village, the second aqueduct branch goes toward the river downstream. By installing a wood water gate between the meetings of these two aqueduct, it’s possible to reroute accumulated water from reservoir back to the river. When the reservoir in the village had been filled with water, the water gate will be closed. 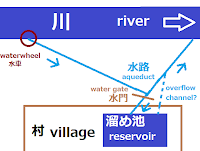 Then the water drawn by waterwheel upstream will flow to downstream, so the reservoir overflow can be prevented. By this, the villagers will always have clear water for cooking and drinking, while the water accumulated in the reservoir can be used for irrigating the fields. Kazura left Village chief and others to do their work. Once again he pulls the pull cart towards the river upstream following the aqueduct. Kazura and the villagers split themselves into groups that consists of several people. He also distributed several sheets of printed instructions about assembling the parts. Then they started to work on their respective task. The engineering firm director had also delivered a mostly illustrated assembling instruction. It was quite easy to understand the explanation of the steps in assembling the parts. Even though Valetta and the others could not read Japanese, they could recognize “A-1” or “B-1” number parts in the instructions, so somehow they were able to assemble it. Kazura was checking the parts that the villagers assembled, measuring the width of the waterway, and confirming the location where the support pillar for the waterwheel will be put in place. He put a stone as a mark on the place where the support pillar will be erected. Then, Kazura’s and Valetta’s group started to assemble the waterwheel together. About 1 hour and a half had passed since they began assembling. Their inexperienced work was about 80% finished. Now, everyone is taking a break and drinking water from the river. Then, the village chief and the others arrived while carrying the wood aqueduct and its supports. Beside the villagers that were building the aqueduct; the mothers and their infants, children and elderly also came. Everyone in the village apparently came. ... ... maybe there is no one who stayed at home. Despite the heavy workload, because the village chief and the villagers had been tempered by their daily works in the fields, no one had tired looks. Instead, because they weren’t familiar with their works, it were Kazura and his groups that look tired. In any case, the aqueduct had been finished, so the waterwheel also had to be finished soon. The village chief addressed the villagers who were taking break. The villagers were shouting loud and start to resume assembling the waterwheel. Kazura gave the tape measure to village chief so he could measure the depth of the hole. Then, together with Valetta, he started to assemble the waterwheel. 20 minutes had passed since the work resumed. The work is almost finished; the only step left is to install the waterwheel. Kazura instructed the village chief to prepare the support pillar, so that it will be firmly fixed, the base need to be treadled many times. Hearing Kazura calls, the villagers that had come to watch simultaneously gathered to help lifting the waterwheel. Because the waterwheel size was smaller than the number of attending villagers, most of the villagers could not help to lift the waterwheel since there were no room for them. Still, they try to help by cheering with their voice. The axle was made from metal so it can’t easily bend even if loaded too much. Still, it is better to be careful when placing the bearing. The bearing is made from metal, so there is no need to worry about it wearing out. Hearing Kazura instruction, the village chief gathered the villagers to install the aqueduct that will receive the water. Then, they dug connection between the channel with the river upstream and downstream with the shovels. Because there are height difference between the downstream and the upstream, water from the river didn’t enter the channel from there. There is a need to ensure that the channel had some water depth, so there is a sill made of wood with the depth about 30 cm near the downstream. Also, to not prevent erosion on the channel’s wall, it had been reinforced using wooden boards. Hearing the village chief calls, the villagers who were resting at the riverside and the children who were playing in the distance, started to gather. When the village chief confirmed that everyone had gathered, the dirt that separate the channel with the river was removed with shovel. With the barrier removed, the water from river start to enter the channel at once. Then, the waterwheel tympanums were pushed by the flowing water and the waterwheel began to turn little by little. Exclaimed Valleta who were standing beside Kazura when she see the bucket that attached to waterwheel tympanum bring water from river and put it at the higher wood aqueduct one after another. The surroundings villagers also were shouting with joy and start chasing the flowing water at the wood aqueduct. Opposite to what he said, he was smiling with joy. While shaking his head, he put the shovels and hammers inside the pullcart. · Now I wonder, how big is the Kazura’s pullcart? It’s the size of cart that you pulled behind vehicle, right? And also, it looks like it is the Two or Three wheels type. Not the Four wheels type. By the way somehow for someone revered, Kazura pull the pullcart too often... Is he somehow had Fillorial blood flows in his vessel? In Japan GREETINGS is BIG, because these are only done between people who had close relationship not something you do to people you deemed as strangers. o Barin (バリン) as Valin, because you know he is Valetta’s dad. 「I understand. Shall I also called father?」 it should be call.
" because they weren't familiar with their works, it were Kazura and his groups that look tired." good chapter this web novel is really refreshing than the other that been popping up. First of all, thank you for the translation. If i didn't visit larvyde.wordpress on a whim. I'll never know this wn got new translator. Could you give me the word for "clasps"? That way, I could check it, but going with that word it would seem to be the parts that fix the paddles to the wheel... Also, "support brace" sounds like the part that keeps the wheel standing in a vertical waterwheel (that is, the "support beams", so to speak), so I would also like to know the original term. "Once we finish with the loading, it's just bringing them home and unloading them, and done." (TL:Rosuru, got better name?) <- Rosle? (TL: I’m sorry I don’t understand... I know the bearing is to decrease friction between the waterwheel axle and its support pillar, but I still can’t grasp the meaning of these two previous paragraphs.) <-For what I can make of it, I'd say that being the axle made of metal in order to not bend, had the bearings been wood, as they are softer, they would wear out soon due to softness and friction, but being metal they are harder and smoother. "Now I wonder, how big is the Kazura’s pullcart? It’s the size of cart that you pulled behind vehicle, right? And also, it looks like it is the Two or Three wheels type. Not the Four wheels type. By the way somehow for someone revered, Kazura pull the pullcart too often... Is he somehow had Fillorial blood flows in his vessel?" 留め金 : I translate it as clasp, since when I use this for goggle image is the belt fastener come out as the top images. Or it means it was secured with metal fastener? The Support Brace was 支柱. Since when I enter it in Google Images, various kind of Supporting/Bracing Pillars was come out. Thanks for the chapter and the picture! 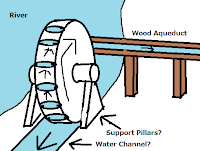 The picture helped me figure out how the waterwheel works since I couldn't picture it. For the shovel thing, it's most likely that Shovel is a loan word in Japanese and is thus spell with katakana. If I had to guess, in regards to the bearings. They should be a collection of many smooth metal balls that are all the same size. They will last quite a long time normally, but if even one of the many balls is damaged, it will increase the wear in a very large way. And it only takes a small dent on one ball to start it. Ah... you're right... How can I miss this... Many thanks for you!